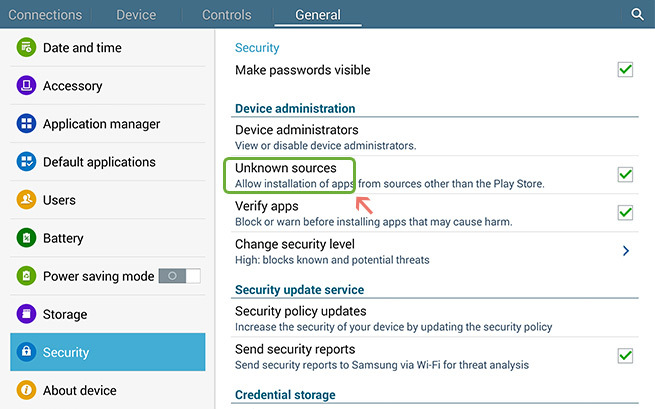 To install applications that are not initially present on your device, Android requires you to enable the "Unknown Sources" setting. This allows you to download apps and games from sources other than Google to your mobile device. Note: Any time you're using the Internet, you should take care to download content only from sources that you know (such as Next Healthcare). During the installation process for CareCDS tablet app , follow the on-screen prompts to enable Unknown Sources. The CareCDS app for Android walks you through enabling this setting before you get your first app from the Apps & Games department. To access the Unknown Sources setting directly, press the menu icon or button from the Home screen and tap Settings. Select Security (Android OS 4.0+) or Applications (Android OS 3.0 and earlier). You may need to scroll down to see the Unknown Sources setting.